An occasional series about men - historical, fictional or of my personal acquaintance - who were/are dark, troubled and brilliant. In other words, irresistible. The archetypal BTM. Brooding, resentful, tortured and torturing, Heathcliff lives in misery on the windblown moors of Emily Bronte's classic (and only) 1847 novel Wuthering Heights. 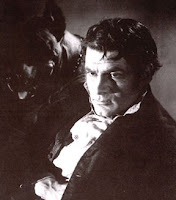 Darkly handsome and obsessive in his love for the headstrong Catherine, the daughter of the man who raised him as a son, Heathcliff becomes terrifying when she marries the better-born Edgar and strikes back by wedding Edgar's sister Isabella and treating her unmercifully. She leaves him, but he, tortured at his own request by the ghost of Catherine and harboring grudges against anyone who ever treated him badly, manages to perpetrate unhappiness by making the next generation miserable too. Played to perfection by Laurence Olivier in the film, Heathcliff is the kind of man many of us wish to be with because we want to see ourselves as passionate Catherines. Alas, most of us are sniveling Isabellas who would be much better off with the hero's namesake, the overweight cartoon cat.